I was super excited to get to see a pre-screening of Brave last night with my family. I love British and Scottish accents, and am a die hard Disney fan. We were all tired, but the movie was engaging and captivating and much more than I expected. I laughed, cried, and my son was scared a little., but he loved it too. While the previews all make the story seem to be woven around Merida’s fate, it is actually about Mother daughter relationships and responsibilities to family and country. I think that is why I cried so much. I won’t give away much more, but I have had moments with my mother and could completely relate to both Merida and the Mom. We got to watch the movie in 3D, which was gorgeous. They did a phenomenal job of portraying Scotland’s beauty, and there were enough effects to keep you interested. Merida was a strong character for a Disney princess, and a total switch from their traditional roles. I loved the interplay between the parents, and I think I have the triplets all rolled up into one child. My son’s favorite characters were the triplets. He loved their antics, and in many ways is just like them. There were some parts that startled or scared my son and other children in the audience, so I would caution parents with sensitive children to either preview the movie, or be prepared to have them cover their ears/eyes and sit on your lap. There was a little bit of violence, but it mostly involved animals/bears attacking, which is where the movie was scary. At one point my 7-year-old son got really nervous, but he likes to be scared, so I’m not really sure how to gauge his reaction. I know younger audience members were frightened and maybe should watch at home where the sound and experience isn’t as intense. To sum up our experience, this is a 5 star movie, and a must see/own. We will be buying a copy as soon as it comes out on Blu Ray. I loved the accents, the scenery and the story. Merida was refreshingly un-princess like, has gorgeous red hair and multiple talents. We loved her relationship with her family. I find many DIsney movies lack that family bond, and it was refreshing to see a movie where the family bond and their relationships were played out so beautifully. Parents were parents, and children were children, but in the end, the family was central to the story, and a huge part of what makes me love the movie. “Since ancient times, stories of epic battles and mystical legends have been passed through the generations across the rugged and mysterious Highlands of Scotland. In “Brave,” a new tale joins the lore when the courageous Merida (voice of Kelly Macdonald) confronts tradition, destiny and the fiercest of beasts. Take into consideration your child’s age and temperament, but this is a must see movie for the summer. I would even make it a date night. My husband liked it and he’s pretty picky about “girl” movies. Then come and let me know what you think. It’s looks cute! I can’t wait to see it. Thanks so much for your honest review! I have not been to see a Disney movie in the theater for years but thought this one looked worth it. Now I know it is! I’m glad to hear about the mother/daughter relationship angle, and that there is a message behind the movie. I willl definitely want to learn more about that aspect of the movie before going to see it. Thanks for sharing! I’m so jealous you got to go early! I have heard amazing things about this movie – we’re going this weekend, and I cannot wait! I still haven’t seen this movie but it looks so cute. Love that Merida is a strong willed. Thanks! I cannot believe I didn’t hear about this one. The movie trailer looks absolutely great! Excellent birthday party movie for kids…even the boys loved it! Afterward we served a bull’s eye cake with little arrows in it. Lots of fun! I got movie ticket vouchers from Disney Movie Rewards just so I could go with my two daughters. I just know it is going to be great. I will try not to cry too much and embarrass them! The family saw “Brave” — great kids pic! I recently saw this with my younger cousins and it was great! Thank you for review. I can’t wait to see this! It looks like a really good movie. I plan on seeing it this weekend! Can’t wait to see “Brave” with the kids. Thanks for the review we’ve been thinking about taking the kids! It’s cheaper on DVD and then you get to own it forever. We’ll buy it when it comes out. We usually don’t go to the theater because of the price, so this was a real treat for my family. I can’t wait to see this! I love disney! Can’t wait to take my children to see this movie. Just waiting for a not so hot 110 degree to go. I cannot wait to see this , and I bet my daughters will love it! Thanks so much for the info about Brave. I actually won an admission ticket to it the other day and I know my son (11 yrs) wants to see it so I will likely be going. It does sound quite good. When I was young there was nothing even close to this sort of thing available…I am old. 😉 I do appreciate you taking the time to explain what it is all about so that I have a bit of an idea before I get there. Thanks again! Can’t wait to see this movie! I hope my grand daughter loves it! Sound like a great family night out! I will definitely take my family to see the 3D version. I can’t wait! I never do this, but I took my kids on opening day. It was a cute movie. Not the best Disney movie I’ve ever seen, but cute nonetheless. The male characters were a little hard on the eyes (lol) and I think this is the first Disney movie I’ve seen where the princess didn’t end up with a prince! So just an update… I saw this movie last night with my friends kids and it was a hit with everyone. The 5 year old was quite scared during the bear fighting scenes, but other than that, she loved it. Even the adults were talking about how great it was! “Brave” looks like an excellent pic! going tomorrow to the matinee. I love matinees. You are so lucky to get to the pre screening. I can not wait to see this movie with my girls! It looks like such a fun movie! I think I’ll take my sister to watch this one with me. I’ve been wanting to see this since I first saw the previews. Looks hilarious! Sounds like it may be a good movie! 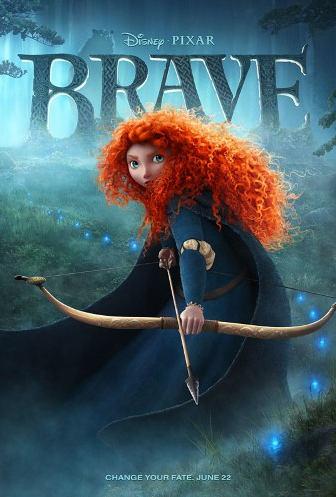 “Brave” looks like it will be a good flick. I would like to take my son to see this, I am hoping it isn’t too scary for a 2 year old. It is funny, and lovely and happy and moving. A Disney trifecta. I love it. I’m planning to see this movie! OMGoodness. I so want to see this even more now!! I am so thrilled that it has a mother/daughter central plot. That is my home!! It is just me and my daughter but she is not little. LOL, she just turned 20 🙂 Both of us thought are so excited!! I’m planning on taking my friend’s children to this movie at the drive in this weekend. Can’t wait! I can’t wait to see this one. Looks like so much fun!! I really want to take my step daughter to see this. Love Disney – something fun for the whole family.